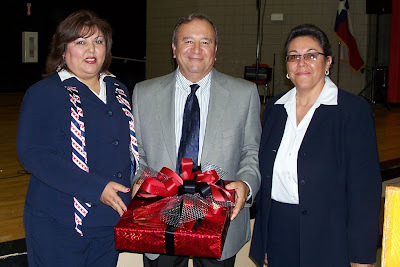 Rio Grande City High School Principal Mr. Jorge Recio is presented with a gift in appreciation for his hard work and dedication by his staff. The high school has achieved a "Recognized" rating by the Texas Education Agency. This honor that Mr. Recio attributes to his students, teachers and all other support personnel who play a vital role in the education of students. (RGCCISD Photo).